Over the next six to eight years, Lafayette will be in a position to attract a more diverse and highly qualified student body than ever before. During that time, the College is planning to increase its enrollment by about 400 students. That partnered with initiatives to bolster our faculty, increase financial aid, and create more inclusive admissions policies will allow an even stronger Lafayette to emerge. As Lafayette moves forward with these initiatives, the increase will occur gradually, hand in hand with enhancements to its infrastructure and facilities to help accommodate its growing family. A major component of the plan is providing more living space for students through new residence halls on the eastern edge of campus. This is an early conceptual diagram of how the project might look. The buildings would be in a two-block area bordered by Cattell, McCartney, and High streets, and Clinton Terrace. An expanded parking lot is being proposed south of Clinton Terrace. These are preliminary sketches showing where buildings might be located, and do not reflect finished designs or approved plans. 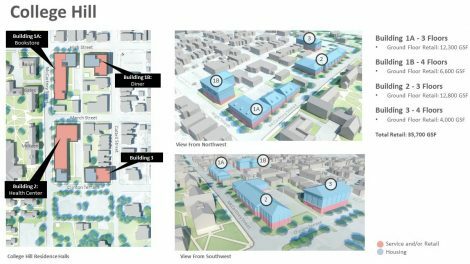 The four proposed buildings would consist of mixed-use residential and commercial locations and would be built in several phases, with phase one completion targeted for fall 2018. Byerly held an open meeting with College Hill residents Aug. 16 to get community feedback. A similar meeting will be held on campus this fall. The first floors would contain businesses that provide services to both the Lafayette and Easton communities, including an expanded bookstore, a College-run diner, and a walk-in health clinic. The top floors would be used for student housing of about 550 beds. The project would call for about a dozen College-owned buildings to be taken down. Lafayette owns all the properties needed to complete the project. As these plans would require the relocation of some student programs that occupy these houses, including Portlock, Hillel, and Newman, the administration would work with these groups to identify appropriate alternative locations with the goal of using this opportunity to address some of their unmet space needs. The restaurant is the last bastion of social life at Lafayette. It is beloved by the students and would be a major detriment to the success of the school in providing students with places to go and things to do. Congratulations to our president for initiating this bold plan. This will make our beloved school more attractive and relevant for future students. It is also the fiscally responsible thing to do. I will make the same comment I made when our committee was considering the placement of the Center for Global Education behind the President’s home – safety of those crossing busy streets, students or others, sober or under the influence. Signals activated by pedestrians are fine but likely to be ignored by students. There needs to be passive safety measures such as speed bumps, textured surfaces, blinking lights, warning signs, etc. for drivers. Additionally, lighting at night. “Bump-outs” from curbs. What happens to Campus Pizza? ?